Using the best dynamic glass available, this all glass system offers instantaneous opaque privacy or transparent connectivity at the touch of a button. 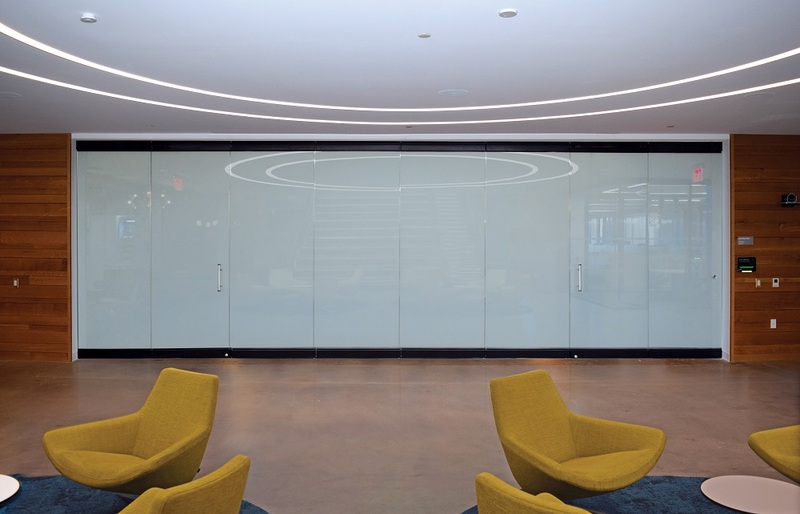 NanaWall WhiteOUT uses the best dynamic glass available within our frameless all glass system to offer architects and designers instantaneous opaque privacy or transparent connectivity at the touch of a button. NanaWall Systems will introduce the new NanaWall WhiteOUT™ glass wall system at the AIA Conference on Architecture in New York, June 21-23 in booth 1957. WhiteOUT is the first individual panel frameless opening glass wall system that provides visual privacy or transparency on demand. At the touch of a button, the opacity allows it to be used as a whiteboard or projection screen for maximum space efficiency. When not in use, the glass panels can be stacked remotely and out of sight to allow for flexible connectivity of spaces. NanaWall will also be unveiling NanaWall 3D Visual Studio at AIA—an exclusive, cloud-based design tool that provides architects with an interactive solution to visualize and animate their design using NanaWall Single Track Sliding glass walls. The tool renders and emails consolidated CAD and PDF files of design drawings, making it easy to incorporate the system into the project. The company will feature cero® on the show floor as well, which achieved an STC 43 sound rating for interiors with the Flush Sill option. The ADA compliant Flush Sill is the shallowest available in the large panel minimal sliding glass wall industry, making it optimal for interior construction. Cero’s double glazed option combined with the Flush Sill offers architects a new design choice for interior applications requiring acoustical privacy, such as conference rooms. For AIA attendees, the company will host a CEU course on June 21 at 4:00 p.m. in the CE Theater, discussing sustainable design for large opening walls. The course includes innovative ideas to take into the design process for schools, hospitals and other commercial applications. NanaWall is also proud to announce the grand opening of its new permanent New York office and showroom. The location features a large selection of NanaWall Opening Glass Walls so that architects and designers can view and operate the products firsthand. For more information about NanaWall and its products, please visit nanawall.com. For over 30 years, NanaWall Systems has pioneered the category of opening glass wall systems. The company has earned the trust of architects, builders, design professionals and homeowners as a custom solution for re-imagining how buildings, people and the elements interact. By combining precision engineering and outstanding design options throughout more than 25 unique award-winning systems, NanaWall Systems advances design possibilities beyond the conventional for almost any space. NanaWall Systems is headquartered in the San Francisco Bay Area with 25 showroom and design studio locations across North America. Founded in 1857, the American Institute of Architects consistently works to create more valuable, healthy, secure, and sustainable buildings, neighborhoods, and communities. Through nearly 300 state and local chapters, the AIA advocates for public policies that promote economic vitality and public wellbeing. Members adhere to a code of ethics and conduct to ensure the highest professional standards. The AIA provides members with tools and resources to assist them in their careers and business as well as engaging civic and government leaders and the public to find solutions to pressing issues facing our communities, institutions, nation and world. Visit aia.org. When called for, this unique product allows the all glass panels to be used as a projection screen or whiteboard.